Could The Fertility Diet Help You Lose Your Baby Weight? The diet touted for its ability to get you ready for conception got two thumbs up from nutritionists—could it be your best bet even when you're not trying to get pregnant? You may have heard of The Fertility Diet, a plan that promises to boost fertility among the women who follow it. It might seem like an outlandish claim, but the diet has earned some major cred: A team of nutritionists came together to evaluate and rank popular diet plans for U.S. News & World Report—and The Fertility Diet received high marks. The diet isn't just a good one for women who are hoping to get pregnant either, experts say. The fertility plan made the top 10 list of best diets overall, and is considered a great option for managing diabetes, losing weight, and maintaining heart health. 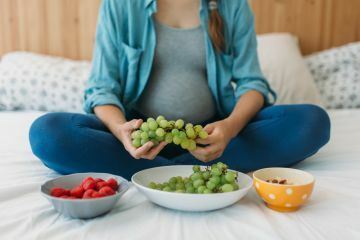 While trying to conceive can be incredibly difficult and stressful, sticking to this diet is not—experts gave it the top spot on a list of easy-to-follow diets. If you're trying to conceive, it certainly can't hurt to give this plan, which claims to increase ovulation and get you pregnant quickly, a go. If nothing else, it'll help you focus on eating things that are really great for your overall health, and that's never a bad thing. We're never in favor of skimping on nutrition, crash dieting or starving—which is why we would suggest looking into a diet like this one, that emphasizes eating things that are just plain good for your body. This diet is based around good fats, whole grains, and plant protein (whole-wheat avocado toast and lentil soup? We'll take it!) The plan also allows you to indulge in full-fat milk, which, according to the creators of the plan, is better for fertility than skim. Those are just the kind of things you should be eating post-pregnancy, too. The Fertility Diet was created by Jorge E. Chavarro, MD, and Walter C. Willlet, MD, two Harvard-educated doctors who, along with co-author Patrick J. Skerrett, published a book on the subject. "You don't have to follow all 10 steps at once," the U.S. News experts said of The Fertility Diet. "You can gradually tackle more when you feel comfortable. Start out by avoiding trans fats, which are found in refrigerated cakes, pie crusts, biscuits, frozen pizza, cookies, crackers and ready-to-use frosting." What plan did you follow to lose your baby weight?